I love to travel. There is something about seeing new sights that makes you take notice of your surroundings and fully appreciate the beautiful details. I had been to British Columbia before and I was struck by the stunning wide open landscapes all set against the back drop of majestic mountains and contrasting colors. Needless to say, when I got invited by Ford to be a driver on the Explorer Platinum Adventure Tour and take a scenic drive from Vancouver to Kamloops, British Columbia, Canada- I said “Yes!” to this road trip adventure. Press trip expenses were covered by Ford. I received no monetary compensation and all opinions expressed are my own. I arrived in Vancouver and checked into the Red Rock Resort where we got to have a look at the new 2016 Ford Platinum Explorer and see all the features that make it special. The Ford Explorer is the #1 selling family adventure SUV and it is celebrating 25 years with the introduction of a Platinum model. As I listened to all the standard Ford Explorer features and heard about the features specific to the Platinum model, I leaned over and told the person closest to me, “I want one!” It was so much fun to check one out the next day and embark on a girls road trip with my newest buddies, Ashely of Quirky Inspired and Lori of Well Connected Mom. We bonded straight away when we planned our trip together and we set out on our adventure tour at 7:30 AM in order to fit in as many things as possible along the way on our Vancouver to Kamloops drive. 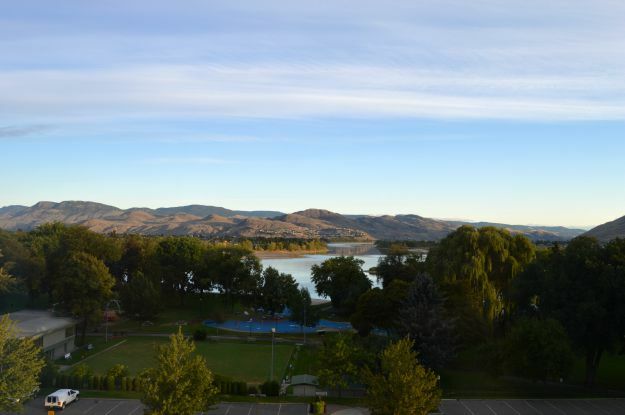 Though it is possible to drive from Vancouver to Kamloops via the Trans-Canada Hwy/BC-1 and BC-5 in just about 3.5 hours, we choose to head up Route 99 for the most scenic route to Kamloops. The scenic route would take you about 6 hours if you don’t stop but there are so many beautiful sights along the way that you will want to stop! 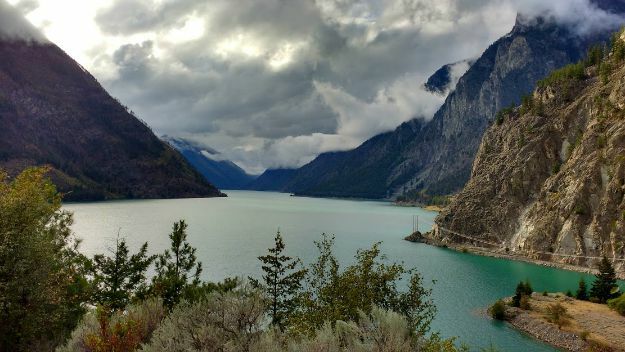 It was difficult to narrow it down but since we only had one day for the drive we chose these top 6 scenic route things to do from Vancouver to Kamloops by car. The trip took us about 13 hours with all the stops we made. I climbed in the driver’s seat of the Ford Platinum Explorer to start off the first leg of the trip. After getting comfy in the Nirvana leather seats and adjusting my lumbar support, seat height, and mirrors, I played with navigation controls, and satellite radio. I started off on a short drive through Vancouver over to Stanley Park so we could catch some of the amazing views of the city, water, and mountains before we left. 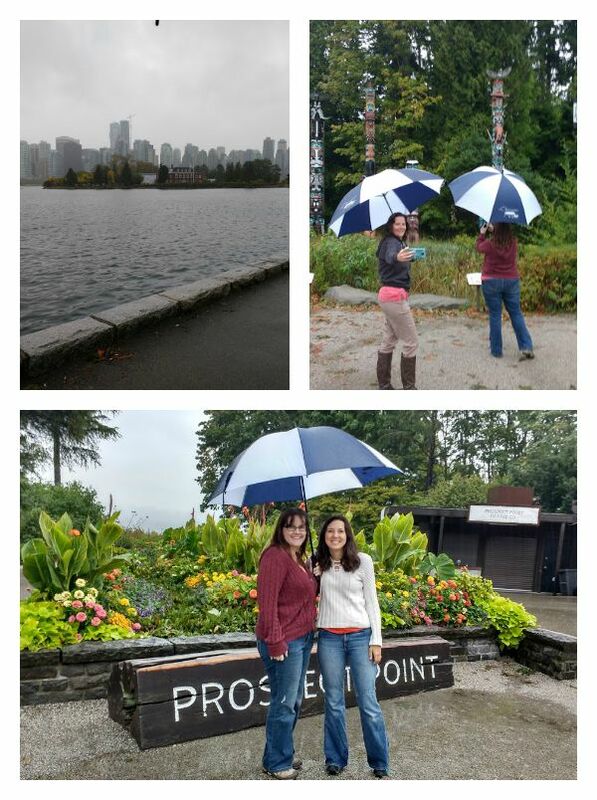 Though it was raining when we arrived at Stanley Park, it was too pretty to stay in the Explorer. We strolled along the water’s edge and we checked out totem poles of the indigenous people. 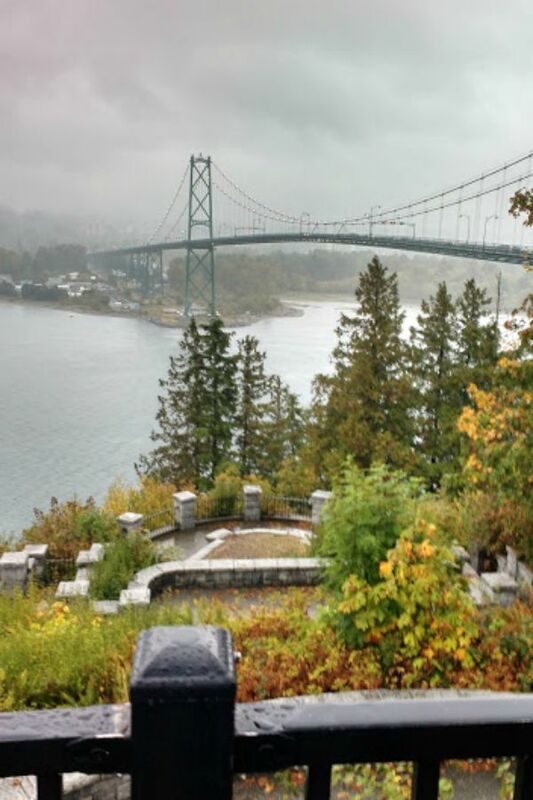 We stopped at Prospect Point where I was caught by beauty of the vibrant gardens and the iconic Lions Gate Bridge bridge which looks much like the Golden Gate Bridge in San Francisco. 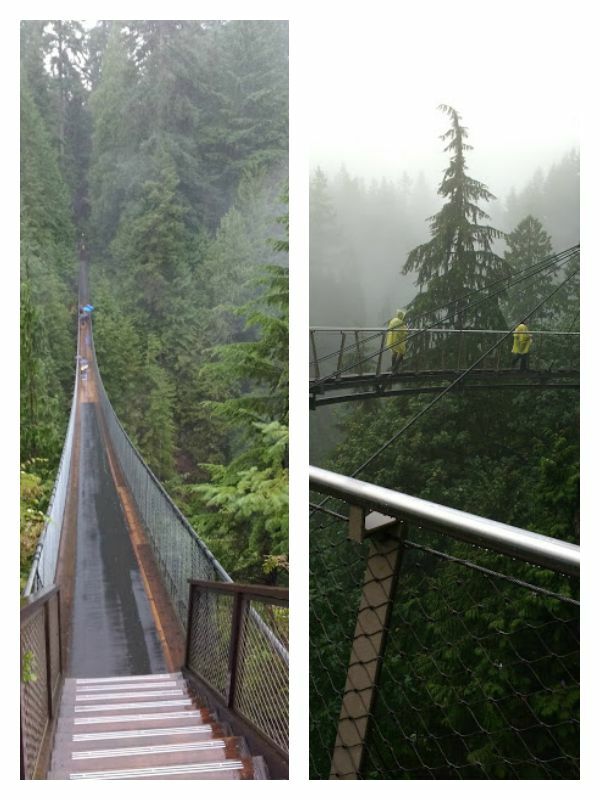 We weren’t sure what to expect from Capilano suspension bridge but it turns out that it is the oldest tourist attraction in Vancouver, (though the bridge itself has been replaced many times and is currently strong enough to hold a 747 airplane). Spanning 450 feet across a gorge and 230 feet above the Capilano River, the suspension bridge offers gorgeous views. There are also bridges among the treetops so you can actually walk through the rainforest Western Cedar canopy. We also enjoyed the new CliffWalk which was against the side of the granite cliffs with metal grated walkways in some areas for an amazing but safe view down. Catch up on some history of the area and learn a little about the culture of the indigenous people through the educational exhibits. It was raining throughout our expedition but that didn’t stop us or plenty of others from exploring this gorgeous park. Other Vancouver Area Scenic Drive Stops: If you have more than one day for the scenic drive from Vancouver to Kamloops, you may also want to stop at Pixel Whale statue right next to the Olympic Cauldron and Seaside Greenway, the world’s largest uninterrupted waterfront path! 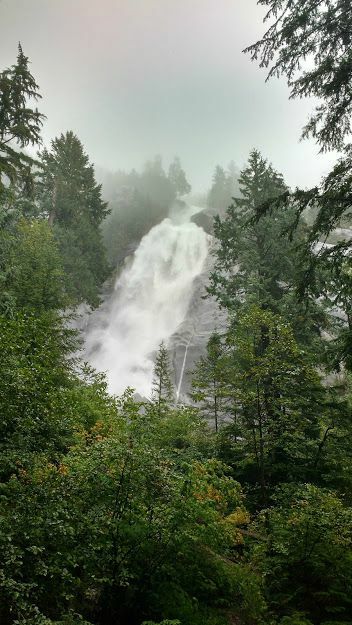 A short walk provides amazing views of Shannon Falls, the third highest waterfall in British Columbia. The massive amount of water pouring down can only be described as powerful and the water spray off of the falls probably would have drenched us even if it wasn’t raining! After this one, we settled in for a longer drive segment since our next stop was around Whistler. We made good use of the heated seats in the front and in the second row to warm up from the rain and dry off and we discovered what may well be my favorite Ford Explorer Platinum Feature- massaging front seats!! I know this is just a luxury feature that I could live without but man, it sure made the drive more relaxing and enjoyable! There were many features that I came to appreciate along our drive route like the blind spot information system system that lights up red on your side view mirror when someone is in your blind spot, smooth handling around the switch back curves, and a smooth ride. Other Squamish Area Scenic Drive Stops: If you have more than one day for the scenic drive to Kamloops you may also want to stop at the Sea to Sky Gondola, as featured in NY Times “52 places to go in 2015” and the West Coast Railway Heritage Park if you are a train buff. Our pit stop in Whistler to “refuel” on some good eats! 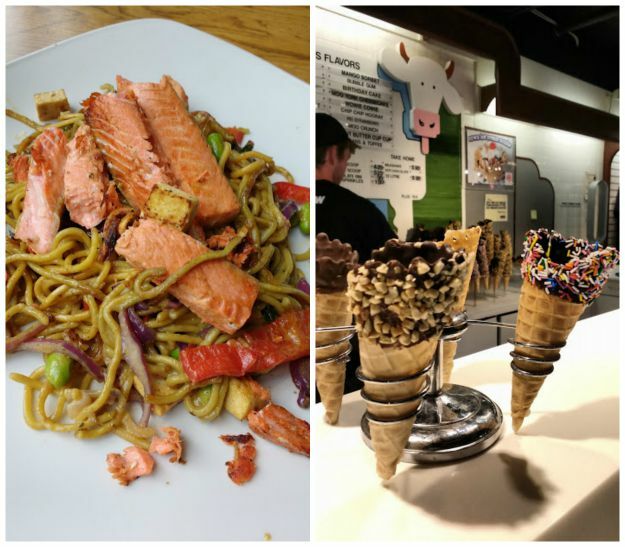 We stopped in at the Mongolie Grill and Cows Creamery but there were plenty of other fabulous eating spots and gift shops to pick out some souvenirs of your Vancouver to Kamloops road trip! Other Whistler Area Scenic Drive Stops: If you have more than one day for the scenic drive from Vancouver, you may want to stop at these Whistler attractions: Peak 2 Peak Gondola, the world’s highest above-ground cable car across the longest unsupported span between towers, Whistler Museum, and Olympic Park. Nairn Falls is a spritual site of the Lil’wat Nation It is about less than a mile long hike to Nairn Falls and as we walked the path, every one on their way back kept telling us “It’s worth it!” The path is dirt and stones but not too scary and Nair Falls are really spectacular as is the way the water swirls in the rock channel after the falls. There are lots of great spots to pull off the road and enjoy gorgeous views of glacier-fed Duffy Lake. The colors are astounding. Other Pemberton Area Scenic Drive Stops: If you have more than one day to drive the scenic route from Vancouver to Kamloops, then you may also want to stop at Joffre Lake for a hike to more beautiful lake views or at Mile One Eating House, as featured on The Food Network. 7. Seton Lake More stunning views along the shoreline of this freshwater fjord contrasted by huge mountains. Then there was just gorgeous mountain scenery along the way that I admired from the window of the car or from pull over spots along the highway. The sun burst out from behind the clouds and the colors were spectacular. I don’t know what it is about British Columbia but I feel like the air is different and everything feels more open. The size of the mountains are captivating and the mint green river waters stand out against the mist in a beautiful way. The blue sky against the yellow fields and oh so green trees just makes your mouth drop with awe. It is truly a feeling that is special of nature grabbing you and filling you with gratitude for such amazing world we live in. #ExploreMore was the hashtag I used to share my photos of the Vancouver to Kamloops drive adventure tour and it speaks to the spirit of the seeking adventure, of enjoying the moments, and being unstoppable! 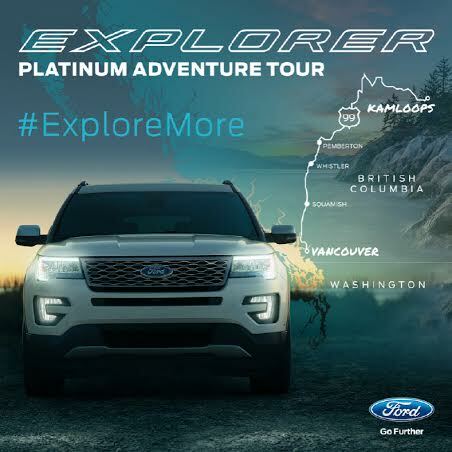 I am thankful to Ford for allowing me to be a part of the Explorer Platinum Adventure Tour. The Vancouver to Kamloops scenic drive was just one leg of the Adventure tour and you can follow along the whole trip which ends in New Mexico by searching the #ExploreMore hashtag. You can find out more about the 2016 Ford Explorer Platinum on Ford.com. Believe me, you will love the Intelligent 4WD with the Terrain Management System,™ the powerful 365 horse power 3.5L EcoBoost® V6 engine that made our trek through mountains smooth sailing. Add in the smart USB charger, power outlet, massaging seats and the 500-watt Audio System from Sony®, and it makes it one sweet luxury ride. I hope that answers your questions about the distance from Vancouver to Kamloops by car, the different routes available, and how long it takes with the scenic stops. Enjoy the drive! Have you been to British Columbia before? Would you love to take a road trip along the scenic drive from Vancouver to Kamloops? Where would you stop along the route? Those are some beautiful pictures and you’re hanging with Ashley!! Wow, the spots you picked are gorgeous! I would love to take that road trip with friends! Thanks for sharing your fun trip! Okay, somewhere in there I saw “massaging seats” and “smart chargers” and “Audio System.” That is some luxurious ride! I’m jealous! Also, what a nice road trip. Doing something like this is on my bucket list! Thanks for sharing! Wow – gorgeous! I have never been to Canada…I have always wanted to go. Looks like you ladies had a great trip! Wow, the suspension bridge is a beautiful sight! A visit to Canada is definitely on my bucket list, and that is one place I will definitely have to see for myself! Wow, so many stunning views! And what a fun trip! I’ve been to Vancouver and Whistler, and both were amazing! We had such a great time in Canada and would love to go back. I love reading posts about Canada! I’ve crossed the Capilano in 2001 (wow, was it that long ago?)! I’ve made the trip from Vancouver to Kamloops before, but not along your route…I think I’ll have to take my family there the next time we’re in Canada during the summer – we’ll definitely need an extended vacation to drive from Regina, but the scenery is amazing! I’m sure you had a comfortable and roomy ride, too! This makes me want to visit Canada even more. How stunningly beautiful! It looks like a wonderful road trip adventure. Love this post! I was in Victoria and Vancouver a couple of years ago. B.C. is such a beautiful area!